WADER uses tracks (range over which propagation loss calculations is required) as the basis for further calculations. The user marks a track on the Main Screen and this track is displayed on the track display chart (bottom centre-left graphic). The BEARING control is where the user selects the marked track or defines a specific bearing. Bearings are preset at 15 degree intervals. 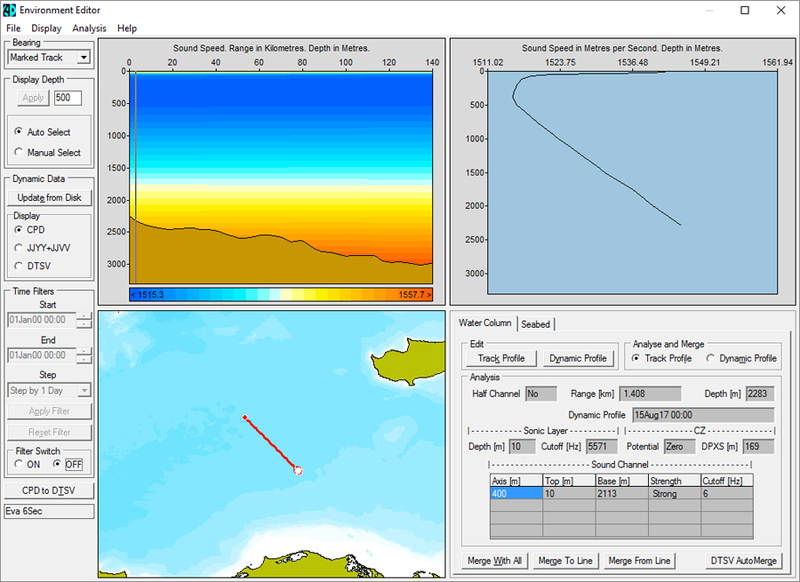 The DYNAMIC DATA control is used to upload water column data – temperature, salinity and sound speed profiles – in CPD, JJYY, JJVV or DTSV format. Users have the opportunity to review and edit the profiles they have uploaded before merging them to the track for analysis. The TIME FILTER control is where the user selects the time period within which water column data is displayed for insertion in the selected environment. Top centre left is the track water column cross-section display. The marker line can be moved and the profile and profile analysis (layer depth, depth excess, CZ potential and sound channel analysis) will update accordingly. Seabed/Water Column tabs display an analysis of the environment at the marker line. Find out more about the next screen – the Analysis Screen.